Our suites float upon the waters of the world’s Jaguar epicenter. The incomparable Jaguars, but without any caveats about the accommodations. Jaguar Suite, Jaguar Flotel, Pantanal, Brazil. The Jaguar Suites go from one side of the ship to the other. The windows that open on the river side and a quiet exhaust fan on the forest side allow cool, night air to flow across your bed. You will sleep in harmony with the rainforest’s natural breezes, with the fresh scents of flowers and the earthy scents of rich humus layers. However, when it’s too hot, you can seal your room and turn on the silent air conditioning. The Jaguar Suites allow you to hear the sounds of the rainforest outside. Because the suites’ energy comes from 50 meters downstream, there is quiet electricity with no engine noise, so you can hear a nocturne of birds, caimans, crickets, frogs and Jaguars. 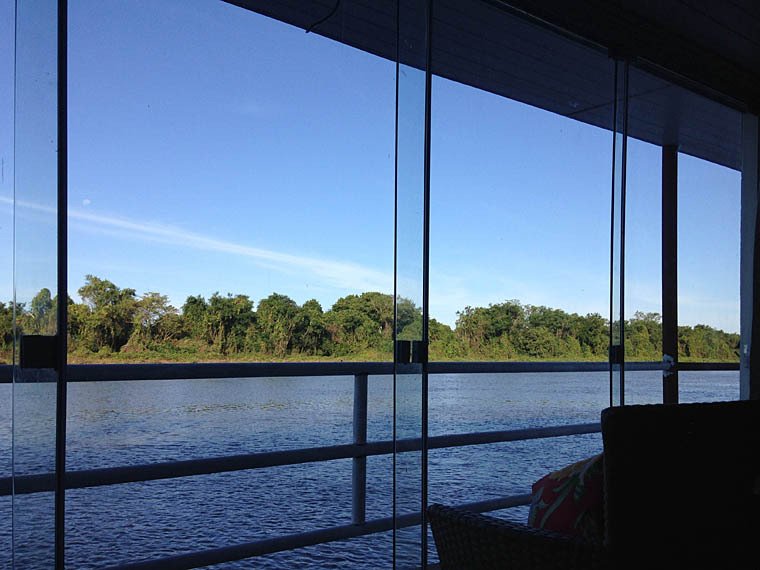 When you are awake, a wall of windows provides a private and unobstructed view of Giant Otters swimming in the mighty Cuiabá River and Paraguayan Caimans (and possibly Jaguars) on the opposite bank. Overhead are Anhingas, Neotropic Cormorants, White-necked Herons, Great Egrets, White-winged Swallows, Ringed Kingfishers and, occasionally, Jabiru Storks and Hyacinth Macaws. On the forest side of the Jaguar Suites, just feet away, are Brown Capuchin Monkeys, Rufous-tailed Jacamars (a colorful songbird), Silver-beaked Tanagers, Black-fronted Nunbirds and an occasional Blue-crowned Trogon. Once in a while, the radio in your suite may alert you to a Jaguar walking slowly along the riverbank, and then you can open a special window to watch it go by. The Jaguar Suites offer a vast amount of table space at the perfect height to write field notes, make bird lists and edit your thousands of photos of Jaguars and Giant Otters (not to mention caimans, capybaras, large water birds and on and on). Plenty of light makes working and reading a pleasure. Abundant electrical outlets power and recharge your laptop and equipment twenty-four hours a day. Ergonomic chairs with footrests provide optimal seating. And there is even more table space for laying out your camera gear and clothing for the daily boating excursions. The Pantanal is famous for its wildlife but not for its creature comforts. With the Jaguar Suites, you get the best of both worlds. 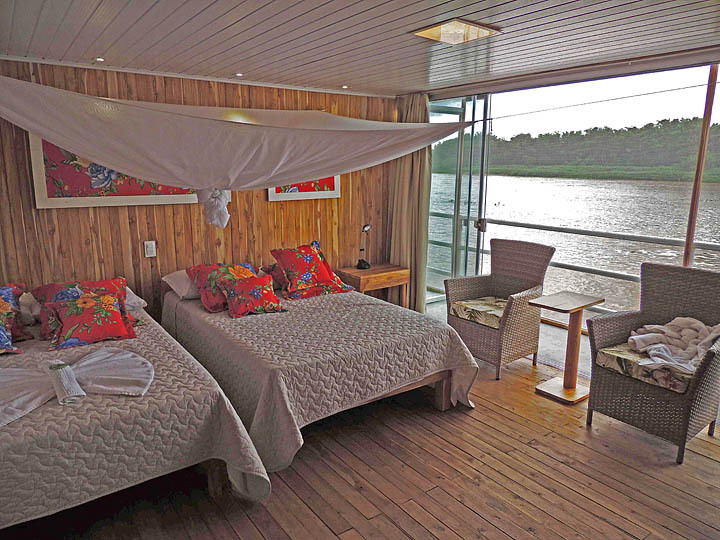 The six Jaguar Suites that float upon the river are three times as spacious as the cabins on the original vessel (291 square feet vs. 97 square feet). 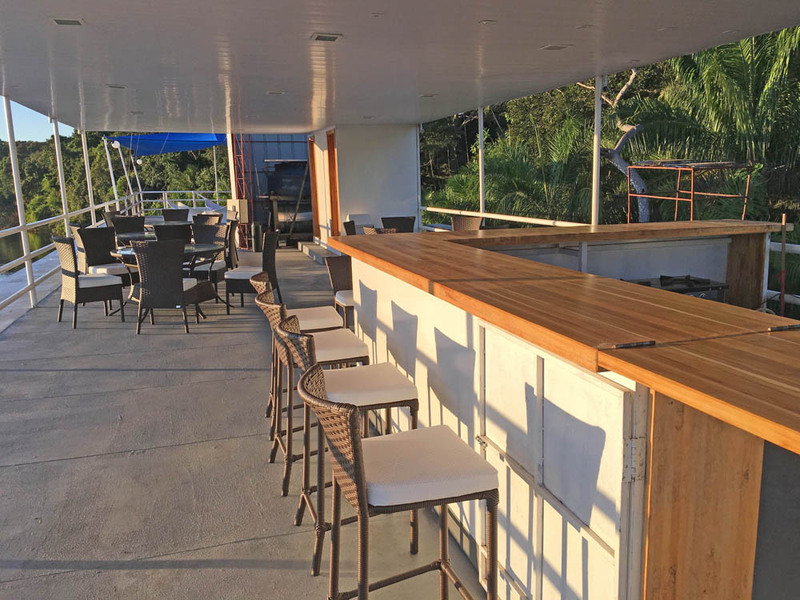 The interiors are finished with plantation-grown teak, which has been locally sourced in accordance with sustainable environmental principles. After a long day of photographing Jaguars and other wildlife, come home to a comfortable bed and pillows, an immaculate bathroom, never-ending hot showers and cold drinks or midnight snacks from your mini-fridge. Best of all, the Jaguar Suites are in the epicenter of the world’s highest recorded density of Jaguars. Because of their unique location, you will sleep and wake up in the middle of the cats, so you get to the cats one or two hours before the competitors and can stay one or two hours later. but without any caveats about the accommodations. Sleep and wake up with the cats! Jaguar Suites, Jaguar Flotel, Pantanal, Brazil. • Special “Jaguar window” on the forest side of the ship along with a 2-way radio to call for room service and for us to call you when a Jaguar is about to walk by on the riverbank. Why Choose Our Jaguar Tour?